1. Retrieve the user from the store based on the approach described in the article: How to use ASP.NET Membership class to retrieve users from the store in VB.NET. 2. Add a button to page and insert a code which manages the button’s click event-handling routine. 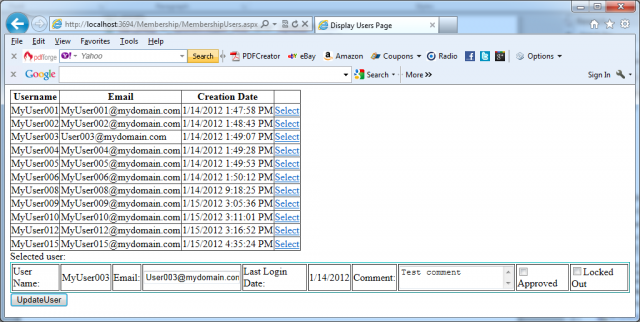 The UpdateUser method just accepts the modified MembershipUser you want to update. Before the method is called, you have to update the properties on your instance. 1. The IsLockedOut property cannot be set, because this property gets automatically set if the user has too many failed login attempts. If you want to unlock a user, you have to call the MembershipUser’s UnlockUser method separately. 2. You cannot change the password directly by setting some properties on the MembershipUser, because the MembershipUser class has no property for directly accessing the password at all. The Membership class itself supports a GetPassword method and a ChangePassword method that requires you to pass in the old and the new password. Retrieving the password through the GetPassword method is possible, but only if the password is not hashed in the underlying store. In other words GetPassword works only if the membership provider is configured to store the password either in clear text or encrypted in the underlying membership store.